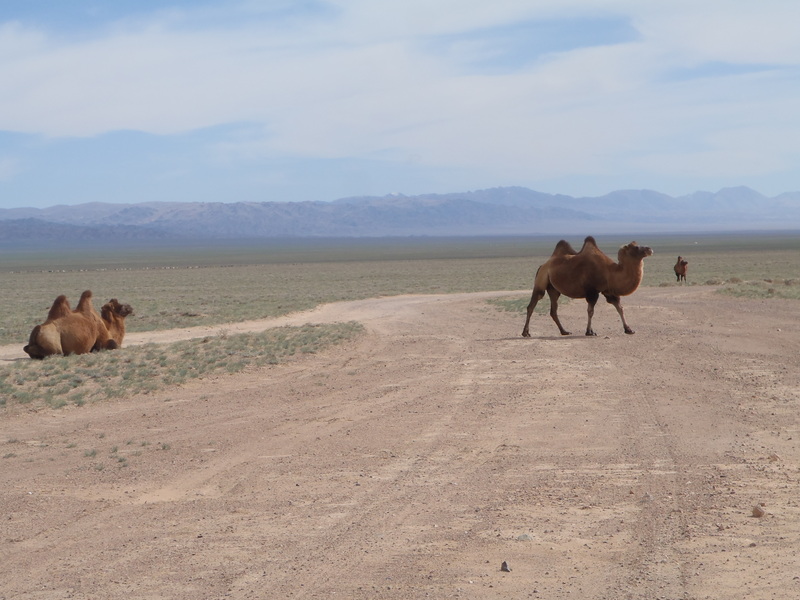 Snow in Mongolia | I should have turned left! Although quite chilly at night the sun has been and the skies have been blue all day and it’s just been fantastic. I would say that the northern route that I did in June is a better off-road route and I think I prefer it to the south but this southern route is still excellent. 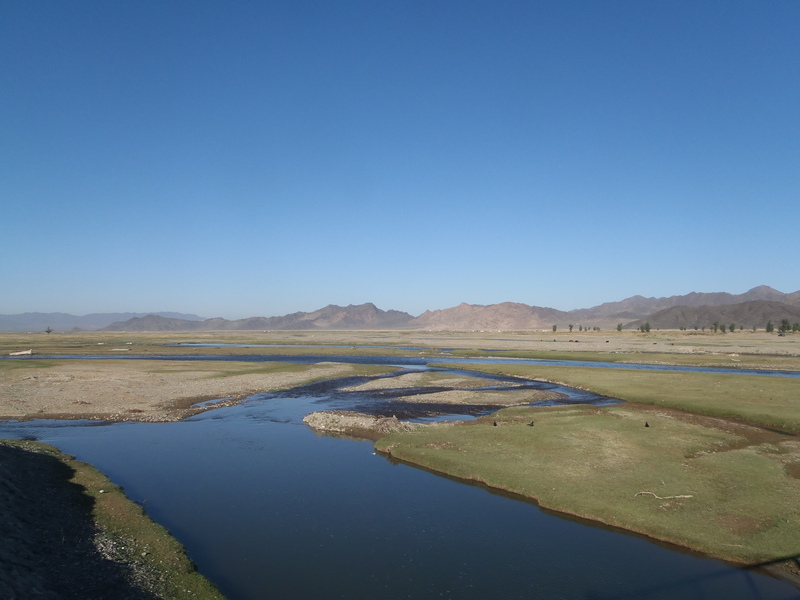 The funny thing I found is that although it is the main route to Ulaanbaatar more often used and more populated I did find it hard to get fuel and had to fill up with 80 octane as opposed to 92, when we did the northern route we had no such problems. On the first day back in Mongolia I stopped at a ger to ask about petrol and they sold me some which got me to the next petrol station where I bumped into Neil, Chris and Nacho. The petrol station had no petrol so I pushed on and left the guys as I wanted to travel alone. I pulled into a small ger village to ask for petrol again and was told no sorry nothing here. Hmm I was now getting a bit concerned and one guy then said ‘’follow me my car’’ I followed to his ger and he siphoned petrol out of his car and sold it to me J so nice. 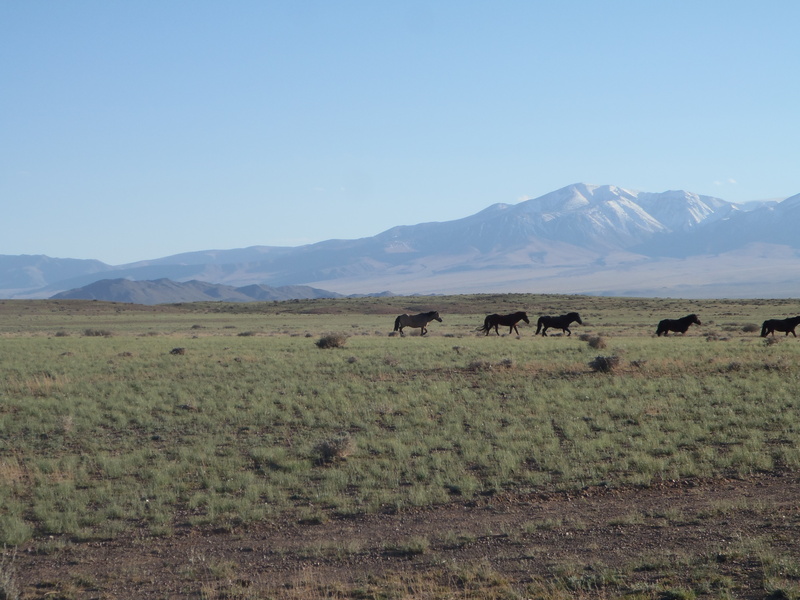 Now I felt safe as my bike was full so off I went to enjoy some Mongolian riding. The day had gotten really chilly and overcast and not being on the main road but off-roading by 5pm we were tired and ready to call it a day. We also decided that after 3 nights wild camping we’d treat ourselves to a hot shower in a hotel. Just as we pulled into a petrol station to fill up and find out about a hotel Nacho sees that Richard is about an hour behind us. We all meet up and decide to stay in a hotel. 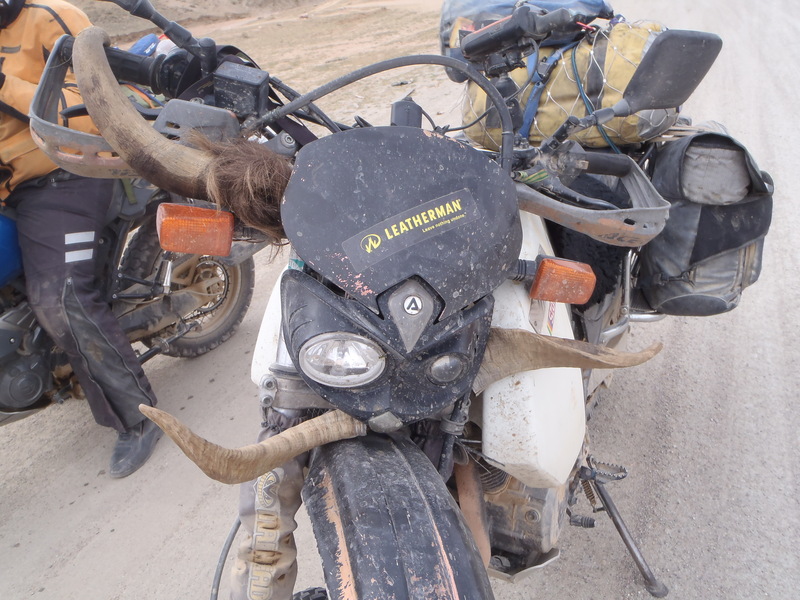 Richard is riding a Suzuki vstrom which is not at all sited to the Mongolian roads and has lost his bash plate twice and Nacho is having some serious front sprocket problems. 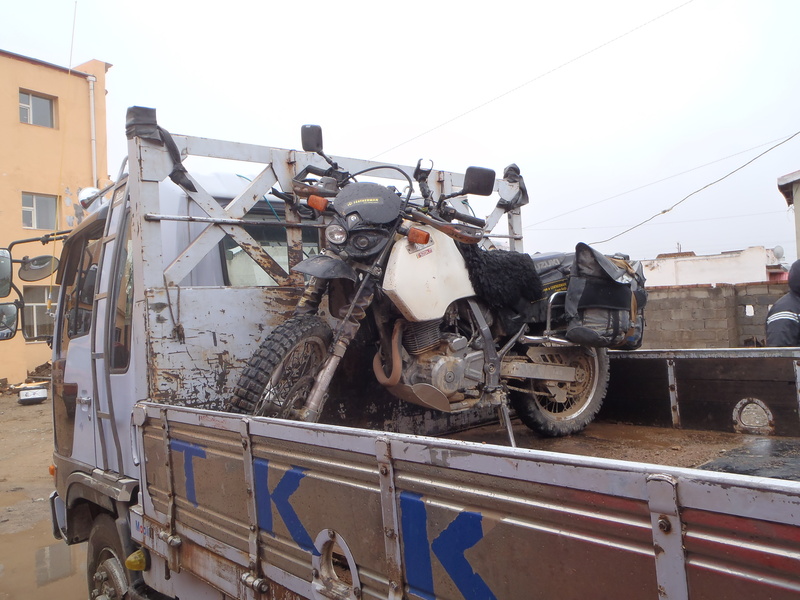 The guys decide they are cold tired and want to save themselves and their bikes from the Mongolian weather (which has now turned cold and rainy) and roads so decide to put their bikes on a truck the last 750km to Ulaanbaatar. This was decided at breakfast after we woke up to find snow on our bikes. I think wimpy boys some snow isn’t going to stop me so gear up and looking like a Michelin man head outside and get on my bike. Hmmm my bike is dead it simply will not start and no amount of begging pleasing coaxing threatening will get it going. We try to push start him, and jump start him, the battery is fine and the spark plug is fine but the mechanic deduces that the starter motor is completely dead. DAMN HELL *&^%^^$#@ this is NOT FAIR. SO to cut a long depressing story short I put my bike on the back of the truck too, it leaves at 5pm, we hit the bar and drink a couple of vodkas and then its ‘early to bed as we need to drive to UB tomorrow.